The navigation bars below provide access to each CHAPTER of this SECTION. For items with an “-X,” access to relevant photomicrographs is also provided. Note:This chapter has been borrowed from another site. Gray (secondary) avigation bars will not be operative on this MDM (foreign) site. This is a dummy section; it is designed to provide the reader with a better understanding of the structure of the actual sections on this site and to acquaint him with the availability, and the use, of navigation bars. The structure of this dummy site, in general, mirrors the structure of all the actual sections on this site (SECTION 14 is an exception). This is a dummy site by a dummy; good luck. 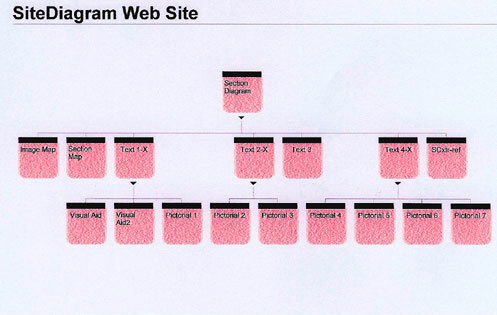 Site diagram: In the above schematic, the aggregate collection of pink units constitute a section; each individual pink unit represents a chapter (page). The diagram or schematic - a dummy site - has application in arriving at an understanding of the structure of Sections1-13 & Section 15. An understanding of the structure of this site will be a great aid for the reader in his attempts to migrate about both the site (composed of multiple sections), and each of the sections. With one exception, each of the numbered sections on this site has 3 tiers - as does the DUMMY SECTION in the above diagram. In the diagram, at the first tier, there is only a single chapter; all of the sections on this site have only a single chapter at the first tier and that chapter is HOME. At level 1, there is no horizontal tier to move along; Home is basically a point. In the diagram, on the second tier, the chapters are all textual, as they are on the second tier of all of the listed sections of this site, with the exception of Section 14. Section 14 is a two tiered site; the second tier is devoted to pictorials. As represented in this schematic, textual chapters 1, 2, & 4 are parents for two or more pictorial chapters at tier 3; they are parent textual chapters (the -X identifies all the parent chapters). For CHAPTERS 1-13 & 15 - as in this schematic - some of the chapters at level 2 are non-parent chapters (on this diagram of a section, non-parent chapters include image map, SCxtr-ref , and text 3); they have no relationship with pictorial chapters at tier 3. 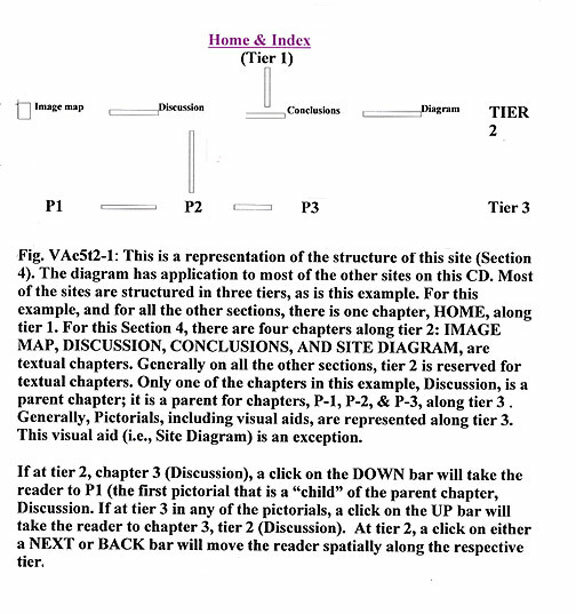 The relationship of pictorials to parent chapters at tier 2 is important, if the reader is attempting to move among the sections of the 3rd tier by using the BACK, or NEXT buttons at the end of each chapter (page). Movement among the sections of the third tier using these buttons is spatially restricted. For example, if the reader is at chapter visual aid (i.e., first item on the third tier) and wishes to then move to each of the next chapters along tier 3, he can access chapter visual aid 2 and pictorial 1, one at a time, in sequence. An attempt to then use this same button to access pictorial 2 would simply take the reader back to visual aid (i.e., the first chapter of tier 3). To access pictorial 2, the reader can refer to the MASTERBORDER to the left; he can then select the navigation button, pictorial 2 . Having gained access to pictorial 2, the reader can then use the NEXT or BACK buttons to move to pictorial 3. Still in the same linear sequence across tier 3, if the reader then were to seek access to pictorial 4, he must again refer to the navigation aids in the MASTERBORDER. He could then finish out the sequence to the end, finally selecting pictorial 7 . If the reader then clicked on the NEXT PAGE or sequence button, he would be taken back to pictorial 4. In moving about the site, the reader can also make use of the BACK button of his browser; this BACK button is temporally functional; it will take the reader to the page previously in view without attention to a sequence along a given tier. The UP button will take the reader up one tier; if at level 3, this button will take the reader up to the respective parent chapter. A DOWN button, if the reader is at a parent textual chapter along tier 2, will take the reader to the first child chapter among the grouped “children” of the respective parent. Although this is simply a schematic - representative of an actual Section - I have included a full set of navigation bars, as will be found in the MASTERBORDER of Sections 1-13, & 15 (using the Melanoma Site as an example). The exclusion of Section 14 will become obvious when the reader accesses this section; SECTION 14 has only 2 tiers and the second tier is devoted to clinical photographs. The clusters in the MASTERBORDER of all the sections, other than this Section and the Section that is dedicated as a SITE MAP, are grouped as either primary bars or secondary bars. The first cluster in the Masterborder to the left, for all the sections, stands as an example of the characteristics of primary bars.. For all of the sections, other than the cited exceptions, the first cluster of navigation bars in the MASTERBORDER will be a first level set; it will provide access to HOME and to all textual chapters at level 2 (i.e., parent and non-parent chapters at level 2). The reader will be able to access all the textual components by referring to this navigation aid. Having gained access to level 2 and then, again, referring to the first cluster, the reader will find that he now has access in the cluster to the relevant pictorials (children) at level 3. A cluster of three bars, at the end of the page, provides access to the individual sections of a web site, the REED PATCH 3 (dedicated mostly to a discussion of problem melanocytic lesions in the “minimal deviation” category. The other bars in this cluster provide access to bweems.com and to a duplication of the material on this CD (the histopathology of inflammation of the skin). A cluster at the end of each chapter (page) on this dummy site provides access to pictorials of tier 3, and to the respective parent chapters. Clusters of either type, if represented at the end of each page, will serve a similar purpose for Sections 1-16. In the above schematic, HOME is the first emblem; it is labeled SITE DIAGRAM. Along tier 2, the first image at the beginning of the tier to the left is labeled, IMAGE MAP. The first emblem of tier 3 is labeled, VISUAL AID. The cluster of three navigation bars at the end of each page provides access to web sites. One of these buttons is labeled “bweems.com;” if the reader has access to the web, a click on this button will take him to the web site of the late Bill Weems. This site is dedicated to a discussion of general problems in dermatopathology. It also provides access to REED PATCH 1. The second bar provides access to my web site, REED PATCH 3; a click on this button will take the reader to a site devoted primarily, but not exclusively, to a presentation of melanocytic lesions. The third web site more or less duplicates the material on this CD. The arrangements of the clusters in the MASTERBORDER and at the end of each page differ somewhat from section to section. In all sections, Primary Bars always relate to chapters of the section in view. In all sections, Secondary Bars always relate to the aggregate of sections or to particular web sites. For some of the sections, the last chapter at tier 2 is a reference page in which the material does not necessarily have relevance for the pathology of the textual pages, or the pictorials; this reference material is variable in its amount and detail from chapter to chapter. If the reader is searching for images of specific reaction patterns (and basically this site is iconography), he might go to the SECTION MAP. For most sections, the SECTION MAP follows the IMAGE MAP on the same page. For 3 sections the SECTION MAP is on the same tier in sequence with the IMAGE MAP, but as a separate page; for these 3 exceptions, the respective navigation button in a cluster in either the MASTERBORDER, or at the end of each page will provide access to the SECTION MAP. If the reader is searching for a rather brief, but general, discussion of a specific reaction pattern (i.e., lichenoid reactions of lichen planus-like type), he can go to the SECTION MAP to identify the appropriate section; he then can go the bar at the end of the page (Directory) and select the respective navigation bar. In the reader’s search for a navigation aids, he should always go to the end of the page, even if the text, or the pictorials seem to be exhausted early on in his movement down the page. The above diagram is repeated on each page of this DUMMY SECTION (SITE DIAGRAM). The reader can visually correlate his position on this section and, thereby, gain an appreciation for the structure of other sections. Primary bars to right provide access to chapters of this section. Secondary bars (colored spheres) provide access to other sections and sites, including web sites.